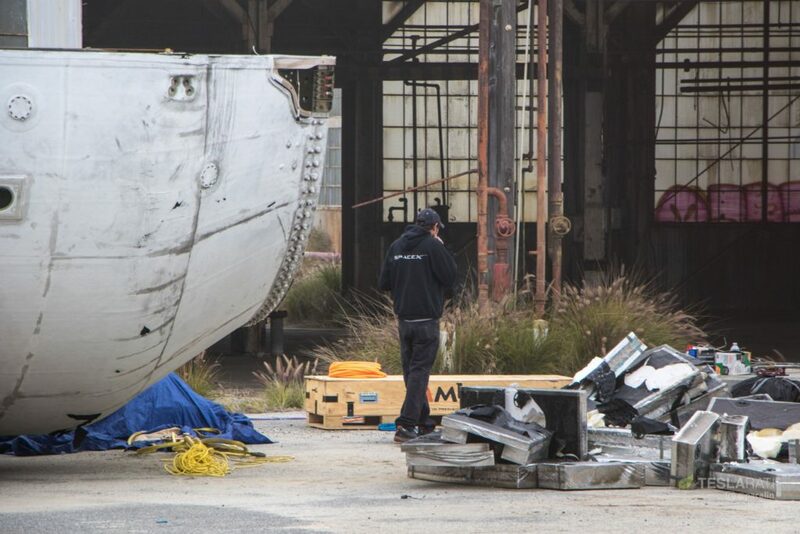 In an unexpected turn of events, the first fairing half recovered by SpaceX – just after the Feb. 22 launch of PAZ – appeared at the company’s just-leased facilities at LA’s Port of San Pedro, also known as Berth 240 or SpaceX’s preferred location for the first BFR (Mars rocket) factory. 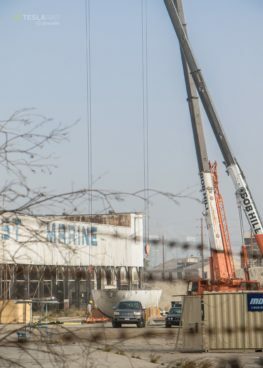 If there was any doubt before that SpaceX was not serious about the Port proposal released in March, or that individuals with SpaceX shirts at 240 were a mere coincidence, the arrival of an entire fairing half and two fairly large cranes ought to confirm the reality of the company’s active presence at the facility. After heading down to the port at dawn to capture Mr Steven’s arrival post-launch (providing a fairing surprise of its own), Teslarati photographer Pauline Acalin made a quick detour to Berth 240 to check up on any potential activity at the SpaceX-leased site. Lo and behold, she found a lone recovered fairing half sitting just off the side of the public Port access road, behind the plot’s fenced enclosure. A giant Z (a la PAZ) on the fairing’s face identified it beyond any doubt to be the half that soft-landed intact just over a month ago. 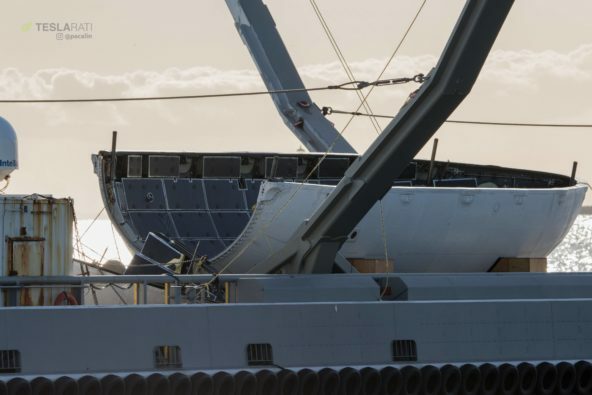 For such a unique pathfinder as the first apparently intact fairing half to be recovered, its uncovered storage out in the open dockside air tells us a fair bit about the reality of its condition: while it’s still surprising that this half did not spend more time (perhaps no time at all) in SpaceX’s Hawthorne facilities, this almost guarantees that the fairing suffered some form of catastrophic and irreparable damage at some point during its recovery. 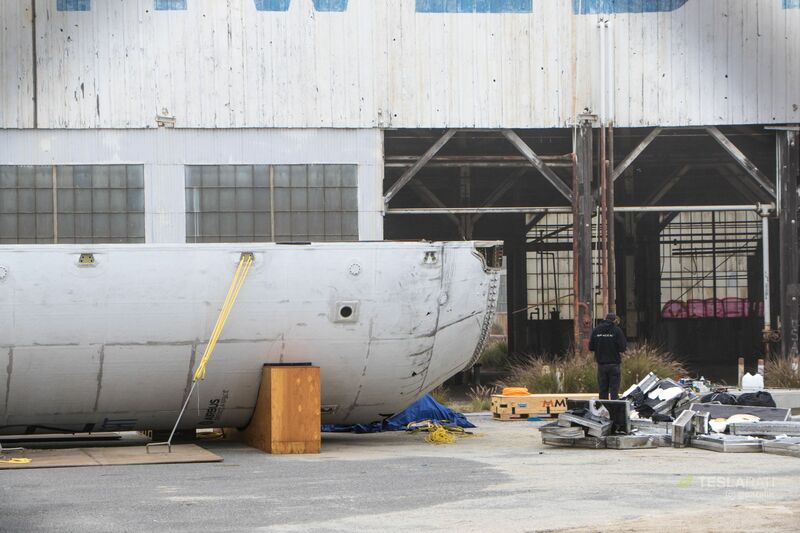 If this fairing were in a flightworthy state, it would undoubtedly be safely stowed inside SpaceX’s Hawthorne facilities for many weeks or even months of careful testing and analysis to properly characterize the condition of the first fairing to be recovered in one piece. 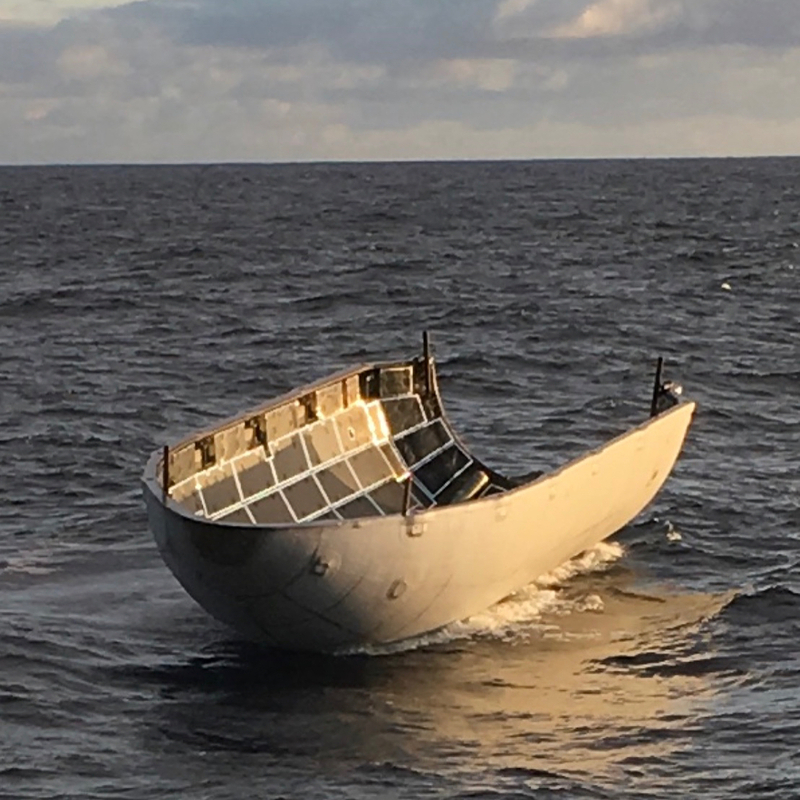 Another possibility: perhaps SpaceX has already managed that characterization and refinement through the many different fairing fragments recovered during past (unsuccessful) attempts. Ultimately, it should come as little surprise that the fairing wound up damaged – the range of conditions it was subjected to boggle the mind. Its damage may have come from post-recovery handling, perhaps something as simple as the surface tension of seawater or some water intrusion inflating its density and overloading the fairing’s structure while it was craned or dragged aboard Mr. Steven. Its loss would appear to confirm that Mr. Steven’s seemingly elaborate net system exists for very specific and technical reasons, instead of, say, a group of engineers realizing that they could convince their managers to let them build a giant claw-boat. Sometimes the crazy solution can be the right solution! 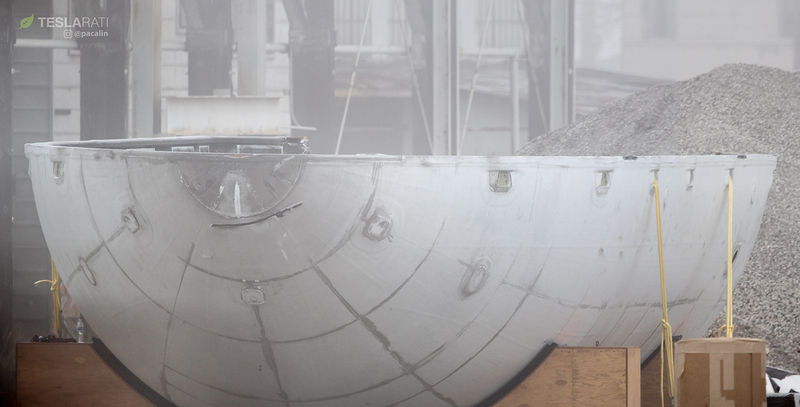 Either way, SpaceX technicians have unequivocally begun to tear down the PAZ half’s many interior components, ranging from baffles and soundproofing panels to parafoil connectors and cold-gas maneuvering thrusters. It’s conceivable that some of those parts can be reused on future missions, partly thanks to the fact that this half remained intact after landing, keeping its interior mostly dry. Given the sheer size of the cranes brought on-site on Saturday (March 31), it seems implausible that they are there just for PAZ’ fairing – more likely, they have been rented or purchased by SpaceX and will be used for a variety of tasks related to the demolition and construction outlined in the Port’s Berth 240 lease and use-case approval. 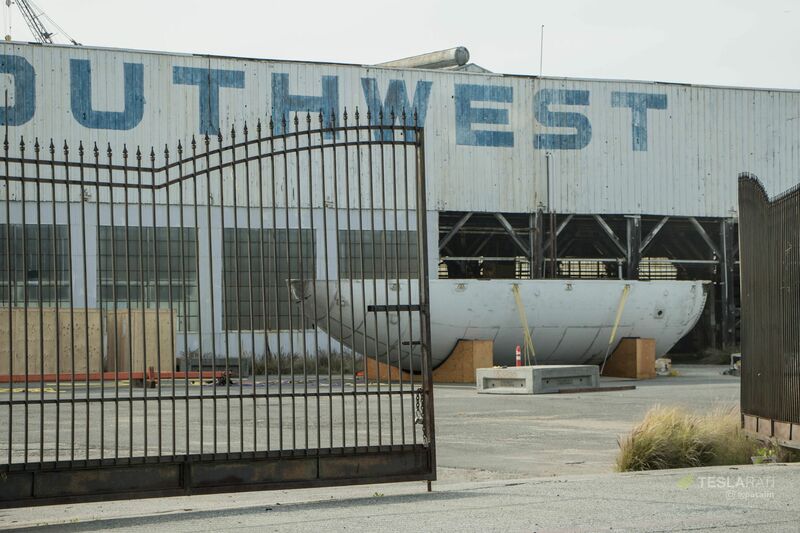 This is almost certainly the first time that SpaceX’s Berth 240 has hosted real rocket hardware, and hopefully foreshadows a bright and busy future of reusable rocket recovery, refurbishment, and manufacturing (hopefully with BFR! ).